Submit ALL application material by the appropriate application deadline. Refer to the individual Academic Program website for program campus location. All applicants are encouraged to submit their applications as early as possible in order to allow the maximum amount of time for the review process. The following programs on the Reynolda Campus offer spring admission with an application deadline of October 1st for international students and November 1st for domestic students. The deadline to submit a complete application for the following programs is January 15th. Most programs will continue to consider applications until all slots have been filled. The following programs have rolling admissions or extended application deadlines while openings remain. Please access the individual program websites for additional information. The application fee is payable by credit card. Payment of the application fee is required in order to submit an application and is required with each application for admission you submit. Payment instructions are located at the end of the application process. Application fees are non-refundable and non-transferrable. No fees will be refunded unless the program is cancelled. 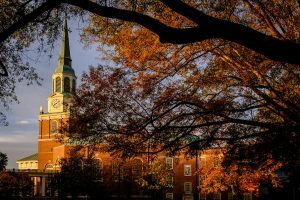 Wake Forest University reserves the right to change any of its website Privacy or Refund Policies at any time. Please notify the Graduate School at the time of application if you qualify for the tuition concession benefit. Wake Forest University is committed to protecting your privacy. Information you provide us is used solely to process your payment. We do not sell, trade or rent your personal information to others. If you have participated in one of the programs below within the last two years, you are eligible for an application fee waiver. The application fee waiver selection is located in the payment section of the online application. NOTE: If you elect to request an application fee waiver during the submission process, you will be unable to re-enter your application to make a credit card payment at a later date. Contact your director/coordinator to request a letter verifying your participation in the program and the dates of your participation. The letter may be sent via email or hard copy from the authorizing official to the appropriate Graduate School Office based on the master program or PhD Track to which you are making application. We also offer waivers to applicants currently enrolled in an undergraduate degree program if they are able to demonstrate significant financial need (recipient of Federal Pell Grant, or NC Education Lottery Scholarship). You may contact your financial aid officer or the university registrar to request a letter verifying your financial need, or a copy of your financial award letter. The letter may be sent via email or hard copy from the authorizing official to the appropriate Graduate School Office based on the master program or PhD Track to which you are making application.